01:39 — Doctor Who: 2010 Christmas Special News. 03:35 — Doctor Who: Matt Smith to quit Doctor Who after his second season? 07:32 — David Tennant: New Marvel Avengers film role as Bruce Banner? 09:10 — Sylvester McCoy: A hobbit in new Hobbit film? 10:06 — Tron Legacy: More casting news. 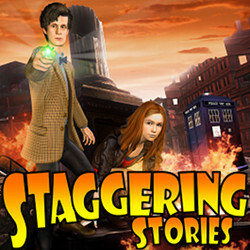 12:15 – Doctor Who: The Adventure Games – City of the Daleks and Blood of the Cybermen. 25:20 – FlashForward: Season One wrap-up. 67:47 – Farewell for this podcast! 68:14 — End theme, disclaimer, copyright, etc. Wikipedia: The Avengers (2012 film). BBC: Doctor Who The Adventure Games. Adam J Purcell, Andy Simpkins and Keith Dunn sit down, distraught, in front of Doctor Who: The Pandorica Opens and spout our usual nonsense! BBC: Doctor Who – The Pandorica Opens. Welcome to the fourth Doctor Who Podcast Alliance joint podcast. This episode was recorded at a signing event with Matthew ‘Adric’ Waterhouse at Waterstone’s, Lakeside, Thurrock, to publicise his new memoir Blue Box Boy and his novel Fates, Flowers. In attendance were various podcasters, including Dave Keep (Professor Dave’s Ark in Space), Tony Gallichan (the Flashing Blade), Martyn Havell (Bad Wilf) and Adam Purcell (Staggering Stories). 22:00 – Tim Hirst, publisher, interview. 27:27 – Talking with attendees. 33:02 – Matthew Waterhouse interview. 43:06 – Mark Humphries, Organiser, Interview. 45:13 – Matthew Waterhouse ‘Blue Box Boy’ Reading. 55:15 – Outro and forthcoming events. 02:17 — Doctor Who: Bookmaker taking bets on Matt Smith axing. 07:14 — Doctor Who: Matt Smith invades Glastonbury. 08:58 — The Hobbit: Peter Jackson to take over directing? 13:01 – Doctor Who: The Big Bang. 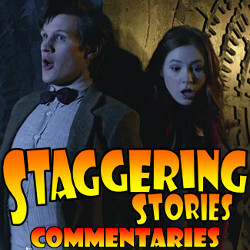 45:57 – Doctor Who: 2010 Season Round-up. 113:14 – Farewell for this podcast! 113:41 — End theme, disclaimer, copyright, etc. BBC: Doctor Who – The Big Bang. 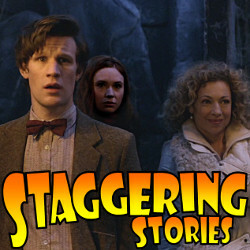 01:41 — Doctor Who: Neil Gaiman’s story set to be third episode in 2011. 02:46 — Transformers: Michael Bay admits Transformers 2 was rubbish. 04:42 — Plan 9 From Outerspace Now in 3D! 06:52 – Doctor Who: The Pandorica Opens. 44:27 – Farewell for this podcast! 44:59 — End theme, disclaimer, copyright, etc. Wikipedia: Plan 9 From Outer Space.